If you received this letter, it is because you have been identified as being part of this big movement that is taking over the world and that is contributing to creating a paradise on earth. Paradism is the name for this new society we are heading to. A society where there will be no money, no work and everyone will do what they enjoy doing. It is the paradise our ancestors have hoped to see and contributed to build for their children and grand children. The time has arrived to enjoy the fruit of their hard work and bring forth the paradise that has long been awaited. Our technological progress cannot be stopped. Paradism is inevitable. All we can do is choose the path of less resistance so as to alleviate human sufferings. And that is perhaps where our views might differ sometimes. But we agree on what is the most important that we are the generation of the transitioning to paradise, and that it is our duty to act on it. We invite you to help us bring about this awareness to the world by celebrating with us the Paradism Day on May 1st. The study of group dynamics shows that it only requires a relatively small percentage of people, a critical mass, to shift the whole group in a particular direction. 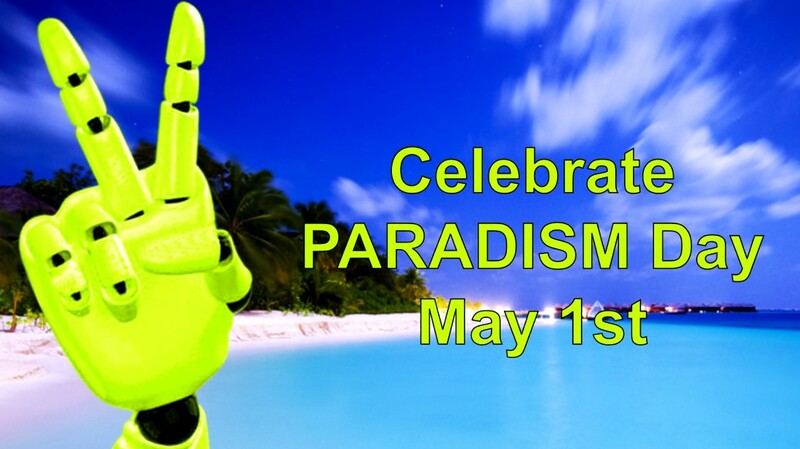 So on May 1st, let's combine and concentrate all our efforts to celebrate Paradism Day, to share and create even more awareness for the creation of the paradise on earth. Notice that May 1st is also the International Labour Day. Many people will take advantage of the demonstrations organised on that day to promote our vision of a world without work: we don't want more jobs, we want more freedom. Give the jobs to the machines and free the people. We look forward to your participation to this global action and hearing about your events. Paradise is our only future!